A handful of featured speakers were announced for Redbird Migration, the free conference for flight training professionals in Oshkosh, Wisconsin, Oct. 16 to 18. Airshow performer Sean D. Tucker, former Alaska Air Group Chairman Bill Ayer, and NTSB member Christopher Hart were announced as speakers for the event that is geared toward inspiring innovation and focusing on future aviators. Clay Lacy Aviation has awarded more than two dozen scholarships to local students learning aviation mechanic skills at the Los Angeles Unified School District's North Valley Occupational Center. Mechanic scholarship applications will be accepted through Oct. 30. The program's FAA-certified courses include theory, lectures, and hands-on projects designed to be completed in two years plus summer sessions when available. The All-in-One Pocket from Switlik allows pilots to organize handheld safety equipment. The pocket can be attached to the company's X-Back Air Crew life vest and has two zipper pockets, interior straps and compartments, and an outside pen holder. The survival pocket is available online from Aircraft Spruce and Specialty Co. in left- and right-side versions for $54.99. Note: Products listed have not been evaluated by ePilot editors unless otherwise noted. AOPA assumes no responsibility for products or services listed or for claims or actions by manufacturers or vendors. Everyone on the ramp has dropped what they were doing to watch an all-time-favorite airplane arrive. But it is the sharp-eyed plane spotter who first notices that this ship is a TF-51, the two-place variant of the P-51 Mustang that once trained military pilots for their combat assignments. 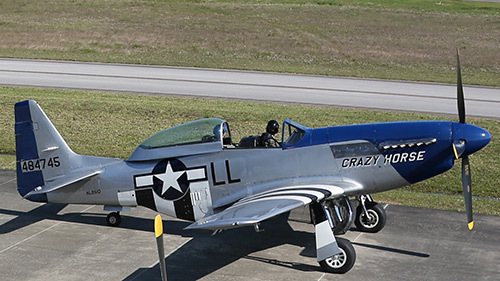 Few original TF-51s or converted P-51s remain; one estimate puts the number at 16, including Crazy Horse, a two-seater that now has the delightful duty of helping make dreams of civilian aviators who always wished for some Mustang stick time come true. Is a pilot required to hold a second class medical certificate to take the commercial pilot practical test? No. According to 14 CFR 61.23(a)(3)(iii), a pilot can take a commercial pilot practical test with a third class medical certificate. However, exercising the privileges of a commercial pilot certificate requires a second class medical certificate. Did you know that student pilots who join AOPA are three times more likely to complete their flight training? Membership includes unlimited access to aviation information by phone (800/USA-AOPA, weekdays from 8:30 a.m. to 6 p.m. Eastern time) or from AOPA Online. Got a question for our technical services staff? Contact AOPA. Topics vary—for details and a complete schedule, see AOPA Online. Want something to do this weekend? Planning an aviation getaway? See AOPA's enhanced calendar of events. You can filter events, add an event, or search all events in the calendar. (Log in to the AOPA Hangar using your AOPA website username and password to search the events or to add an event.) Before you take off on an adventure, make sure you check our current aviation weather provided by Jeppesen. For airport details, including FBO fuel prices, see AOPA Airports. AOPA does not endorse or assume responsibility for the events submitted and listed in the calendar.